Poisonous vs. Venomous – What’s the difference? This is also one of the more frustrating questions, and the terminology “poisonous snake” is used all the time. With a few exceptions, the answer is emphatically NO. BUT – there are a number of venomous snakes! So, what’s the difference? In short, the correct term is “venomous snake”, not “poisonous snake”. A toxin is any substance that is harmful to have in your body. When considering venom vs poison, it’s really the method of delivery that matters. If the toxin is actively injected, such as via fangs, then it’s a venom. If you eat the toxin, or absorb it through your skin, then it’s a poison. When we talk about snakes, the correct term is that they are venomous, since they inject the toxin through their fangs. Being venomous does not always mean lethal. Likewise, lethal and highly toxic do not always equate – especially to the level of threat to humans. The good news is that snake bites are pretty rare in the United States with estimates between 1,000 to 2,000 cases each year and fatalities from those bites averaging less than a handful. Globally, it is estimated that there are millions of bites annually with well over 100,000 snake bite-related deaths. Excellent pit viper antivenin (effective for US pit vipers, e.g., rattlesnake, cottonmouth, and copperhead bites) is readily available in most areas of the U.S.
· That some poisonous frogs don’t make their own toxins but obtain them from the food they eat! · The Asian snake Rhabdophis tigrinus becomes poisonous by sequestering toxins from its prey which consists of toxic toads! · A drug derived from Gila Monster saliva helps diabetics control glucose and lose weight! 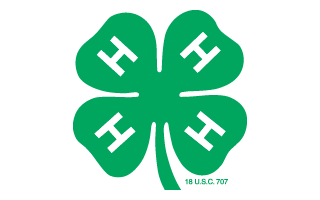 · More Americans die each year from bee and wasp stings than from snake bites! · Snakebite toxins can be isolated and used to prevent strokes and heart attacks! · Compounds from the venom of the black mamba have been turned into a painkilling drug! Here in New Jersey your potential encounters with venomous snakes are limited to the Timber Rattlesnake and Copperhead. Timber rattlesnake color patterns are highly variable across their range (from Canada to the southeastern USA). In New Jersey, they can occur in a yellow pattern with dark chevrons down the dorsal side of the body or be entirely black. A dark color (black or brown) is found on the last few inches of the tail. Black morphs have a black head and may have much black color throughout whereas yellow morphs have a yellow or light tan head color. They also have vertical pupils and as a pit viper, a hole between the nostril and their eye. The timber rattlesnake’s most distinguishing characteristic is its rattle. The rattle is composed of interlocking segments of dry keratinized skin that are not lost during shedding. When threatened, rattlesnakes vibrate their tails making a buzzing sound. This acts as a warning signal to predators. Timber rattlesnakes are found in two separate regions of the state. In northern NJ they are found in the mountainous portions of Warren, Sussex, Passaic, Morris and Bergen counties. In southern NJ they are found in the Pinelands region and nearby portions of Cumberland, Ocean, Burlington and Atlantic counties. These snakes use rocky crevices for hibernation den sites and are often found near rock outgroups, especially in spring and fall. 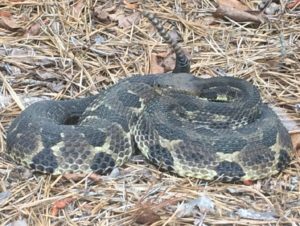 Timber rattlesnakes, or any other snake, rarely if ever bite without being provoked. Nearly all cases of snakebites occur when untrained people attempt to handle them. Snakes will bite in self-defense but will never attack a person. If given the opportunity they will always attempt to escape. Timber rattlesnakes are endangered in NJ and it is illegal to kill or harass them in anyway. The northern copperhead may grow to a length of 22-53 inches and is patterned in two shades of copper or reddish-brown. Its head is a solid copper color. The darker shade forms an hourglass shape over the lighter background, with the wider portion of the hourglass on the side of the snake while the narrow portion is on the snake’s back. It looks a lot like an alternating pattern of Hershey’s kisses. This coloration is excellent camouflage when it lies in leaf litter. Young copperheads, known as “neonates” are paler in color that the adults. Neonates also have a yellow-tipped tail that acts as a lure for prey (they wave the tail tip around to lure in frogs to eat). 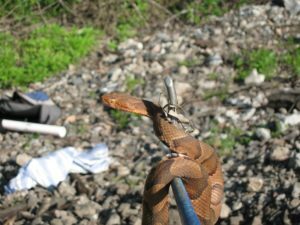 In New Jersey, copperheads are found only in the northern portion of the state, from the Sourlands of Hunterdon, Mercer, and Somerset Counties in the south to the New Jersey/New York border in the north. They may also be found within the Palisades in Bergen County. Within their range, copperheads may inhabit rocky wooded hillsides, rocky fields, berry thickets, wooded wetlands, farmlands, and even old mulch piles. Although copperheads are venomous, no one has ever died from a copperhead bite in New Jersey. They will not chase people, but they will defend themselves if they feel that they are in danger. Due to population declines and habitat loss, the copperhead is listed as a species of Special Concern in New Jersey. The non-venomous and common northern water snake (Nerodia sipedon) is sometimes confused with the copperhead because they have similar colors. Both snakes also have hourglass-shaped bands on their bodies. 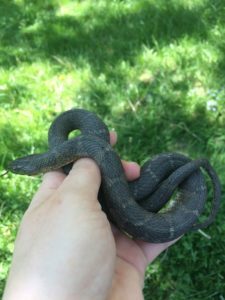 On the water snake though, the darker-color bands are widest along its back and narrow along its sides. We do have some actual poisonous animals here in NJ. 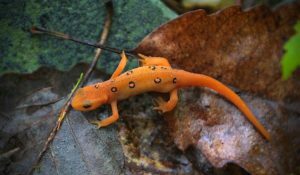 In general, toads are poisonous and so are some salamanders (for example, the red eft/spotted newt is toxic enough to kill most animals that consume them)! It is always a good idea to avoid touching these animals and certainly wash hands afterwards (don’t rub your eyes and certainly don’t eat them! ).